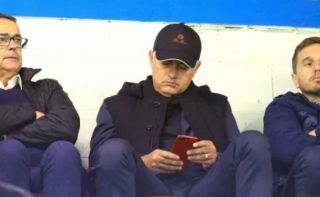 Man Utd boss Jose Mourinho reportedly attended Serbia’s clash with Montenegro on Thursday with an eye on one player in particular, Lazio’s Sergej Milinkovic-Savic. As noted by Sky Sports, it had been claimed that the Portuguese tactician was eager to get a closer look at the 23-year-old on international duty, as he continues to attract plenty of interest. As per Goal.com, the Serbian international is said to be valued at around €100m or above, and there is no doubt that following on from his form last season, he had emerged as one of the top talents in Europe with his physicality, technical quality and attacking threat in Lazio’s midfield proving decisive. He bagged 14 goals and nine assists in 48 appearances in all competitions last season to suggest that the hype was warranted, but he has struggled to live up to expectations so far this campaign as he has just one goal and one assist in nine outings. That will be particularly disappointing for Lazio as it comes after he signed a new contract with the Serie A outfit, but it seems as though interest from other clubs could still be distracting him as he discussed suggestions that Mourinho came to specifically watch him in action this week. Milinkovic-Savic would certainly do well to ignore the speculation surrounding his future, as Lazio have invested their trust and money in him this season and will be expecting better results as the campaign progresses. Nevertheless, a natural knock-on effect of impressing on the pitch will be interest from rival clubs around Europe, and Mourinho is seemingly eager to bolster his squad with the talented ace who could ultimately form a formidable midfield alongside the likes of Paul Pogba and Nemanja Matic.